Source: CICH graphic created using data adapted from Campaign 2000. A Roadmap to Eradicate Child and Family Poverty in Canada. 2016 Report Card on Child and Family Poverty in Canada. http://campaign2000.ca/wp-content/uploads/2016/11/Campaign2000NationalReportCard2016Eng.pdf – accessed July 20, 2017. Government transfers* are critical and effective investments that reduce and prevent poverty among children and families. Without investments in programs like the HST/GST credit, Canada Child Tax Benefit (CCTB), the Working Income Tax Benefit and Employment Insurance1, considerably more children would live in poverty. 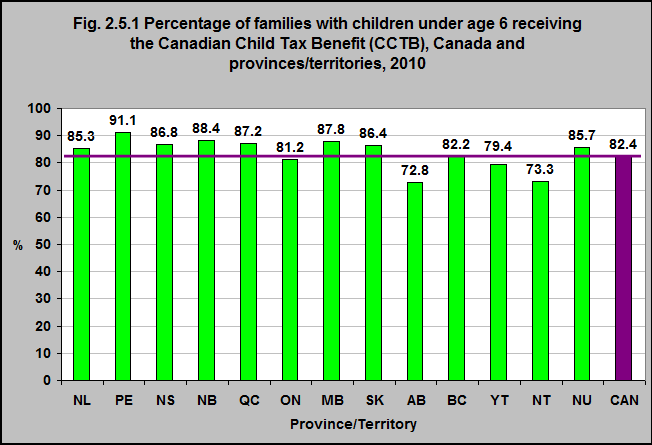 In 2010, 82.4% of Canadian families with children under 6 received the CCTB. This ranged from 72.8% in Alberta to 91.1% in PEI. 1Campaign 2000. A Roadmap to Eradicate Child and Family Poverty in Canada. 2016 Report Card on Child and Family Poverty in Canada. http://campaign2000.ca/wp-content/uploads/2016/11/Campaign2000NationalReportCard2016Eng.pdf– accessed July 20, 2017. *Government transfer payments are payments to individuals by the federal or provincial governments: Employment Insurance (EI), Goods and Services Tax Credit (GST) and Harmonized Tax Credit (HST), Canada Child Tax Benefit, Old Age Security (OAS) and net federal supplements, Canada Pension Plan (CPP) and Quebec Pension Plan (QPP), Workers’ Compensation, Social Assistance and provincial refundable tax credits, Family Benefits and Other Government Transfers. Other Government Transfers (new in 2010) includes Working Income Tax Benefit. Definitions of the transfer payments are available from the User’s Guide to this series, available at http://www.statcan.gc.ca/imdb-bmdi/4105-eng.htm– accessed July 15, 2017.